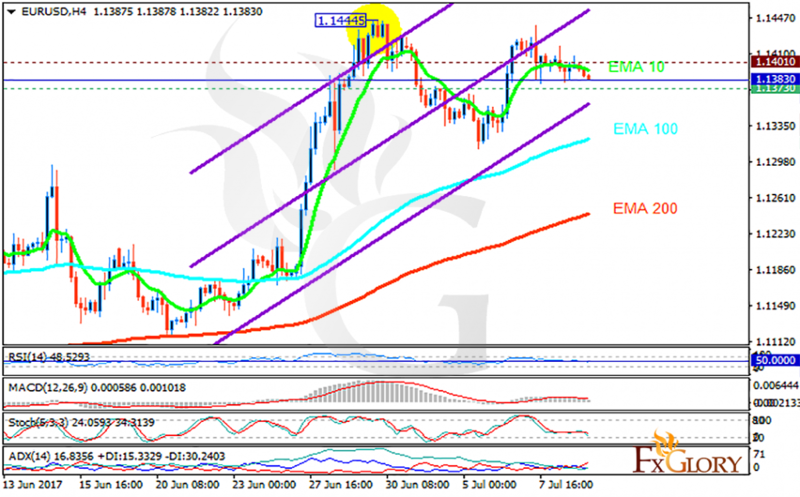 EURUSD has been fluctuating since yesterday and it has not been volatile. Today the same thing is expected to happen because there are no major economic reports only there is Fed member speech later. The support rests at 1.13730 with resistance at 1.14010 which the weekly pivot point at 1.13830 is located in between the lines. The EMA of 10 is moving horizontally along the ascendant channel and it is above the EMA of 100 and the EMA of 200. The RSI is falling towards the 50 level, the Stochastic is showing downward momentum and the MACD indicator is in positive territory. The ADX is showing sell signals. While there are several pullbacks on the way, buyers can target 115.